Oakland is celebrated for many things, but one of the Town’s greatest cultural inventions is turf dancing or turfin’. For those unaware, turfin’ is a street-oriented dance form. It draws from many influences, including popping, boogaloo, b-boying, and krumping, but it has its own unique flavor. It’s an urban ballet of sorts which can be both graceful and aggressive in approach – sometimes simultaneously. A Turf Inc. dancer catches wreck. One signature aspect of turfing is the footwork; while turfers often glide and moonwalk, they make a point of balancing on their toes. Another is the intricate hand and arm movements, which require tremendous flexibility: turfers can become contortionists, twisting their limbs seemingly to the point of muscular dislocation. Acrobatic, gravity-defying displays are not uncommon during a twisting, turning exhibition of turf skills. There’s also an element of pantomiming, of telling a story through physical movements. Turfers will sometimes pop their collars while foot-gliding, and use their t-shirts or hoodies as a prop. Body isolation—looking one way while moving in another direction—is another common aspect of turfing. And of course, dreadlocked turfers will often shake their locks like whirling dervishes. Yet for all its explosive expressiveness, turfing can be very subtle at times; in this regard, it’s not dissimilar to flamenco, another improvisational artform which started on the streets and relies on passion to power the emotional intensity of its performances. The most skilled turfers will have an arsenal of techniques, which they will deploy as necessary, according to the emotion they may feel at any given time. Which brings us to perhaps the most significant aspect of turfing: it’s highly-improvisational. While individual dancers, duos and groups will sometimes choreograph routines, probably 90% of what you see at a turf dance battle literally happens on the fly. So there’s always an element of surprise – you never know what could happen next. Dummy demonstrates a signature move at Art & Soul. Turfing first came to prominence in 2006, when two of the preeminent Oakland crews, the Turf Feinz and Anamaniaks, were featured in the video for E-40’s hyphy-era anthem, “Tell Me When to Go,” shot at East Oakland’s Youth Uprising. Hard to believe, but it’s been almost a decade since then. In those years, turfing has become a national and even international phenomenon. With that being said, the artform is still alive and well in its place of origin, and a new generation of turf-happy youngsters, along with seasoned veterans who have become cultural stewards of the artform, are keeping it thriving. Recently, Oakulture was blessed to witness two huge turfing exhibitions. The first was an all-day event held at Classic Cars West, presented by Oaktown Indie Mayhem in conjunction with Turf Inc., celebrating Turf Inc. – an organization created by turfing OG Johnny 5 – ‘s 2nd anniversary. Besides the colorful bunch of folks who came out, the event was significant in that it featured the first-ever all-styles, all-female competition. 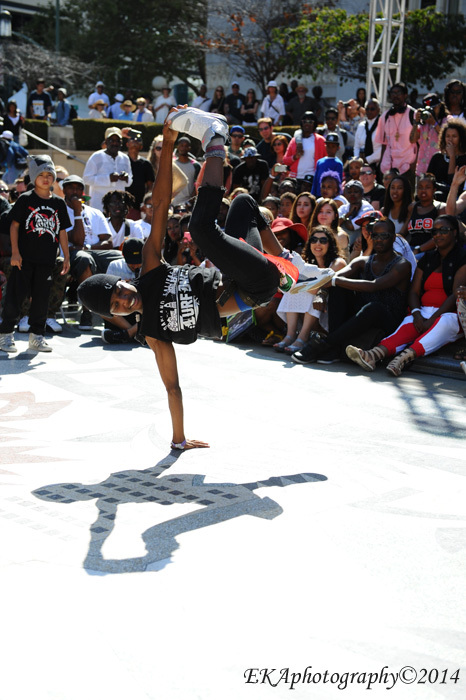 That battle, which attracted participants from as far as Atlanta and New York, was won by Oakland’s own Turfer Girl. While not as limber or athletic as some of her competition – NYC b-girl Android, who went up against Turfer Girl in an early round, was clearly the more flexible of the two; while Atlanta’s Angel, who placed 2nd, had a nice fluidity to her – Turfer Girl’s mastery of pure turf skills clearly won her technical difficulty points with the judges. 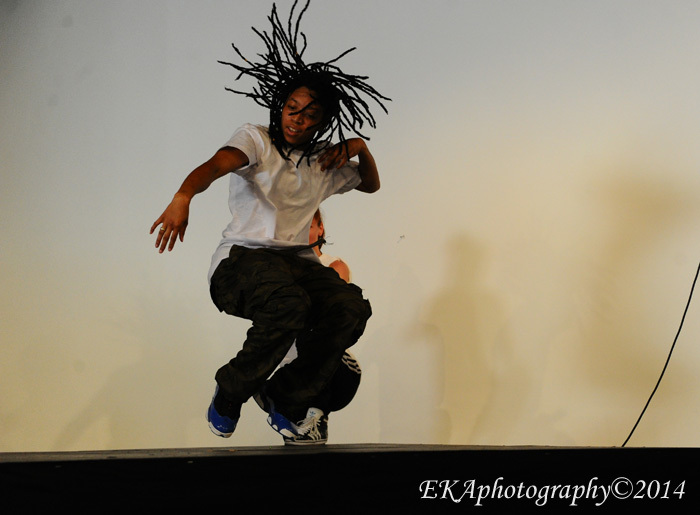 Eventual winner Turfer girl shakes her dreads at the Turf Inc. all-styles battle. The second big throwdown was at this year’s Art & Soul festival, which featured turfing prominently during an all-styles 2-on-2 battle presented by YAK films and witnessed by thousands of festival attendees. The big story of the battle was the emergence of the diminutive wonders, Dem Bague Boys — two elementary school-aged brothers who deftly and nimbly served up an array of b-boy/breakdance skills and beat several more-established, older teams on their way to a final showdown against Krow and Intricate. Dem Bague Boys had heart, and somehow weren’t intimidated by Krow, who made some of the scariest faces this side of Freddy Kreuger as he contorted himself into a human snake, crab, and scorpion. 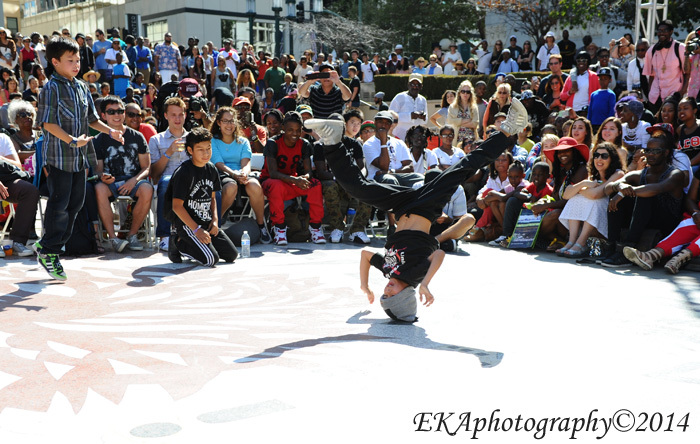 Despite excellent footwork, freezes, poppin, and even an extended headspin by the precocious kids, Krow’s unbelievable mastery of his body, performed at a ultra-high level of technical difficulty – combined with Intricate’s eponymous, precise display of turf moves – ultimately won over the judges. Festival organizers later announced that attendance had doubled over last year’s event, and the popularity of turfing was clearly a huge reason why. Krow twists like a pretzel at Art & Soul. 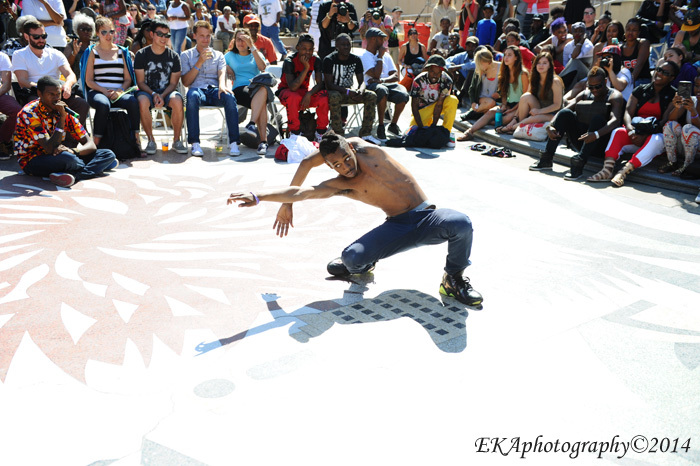 When all the dust cleared, one thing was obvious: Turf dancing isn’t going away anytime soon, and has earned a foothold in the cultural history of Oakland. If you’ve never seen a battle, follow Turf Inc., YAK Films, and Oaktown Indie Mayhem on Facebook for information about upcoming events in Turf City, USA (and elsewhere). 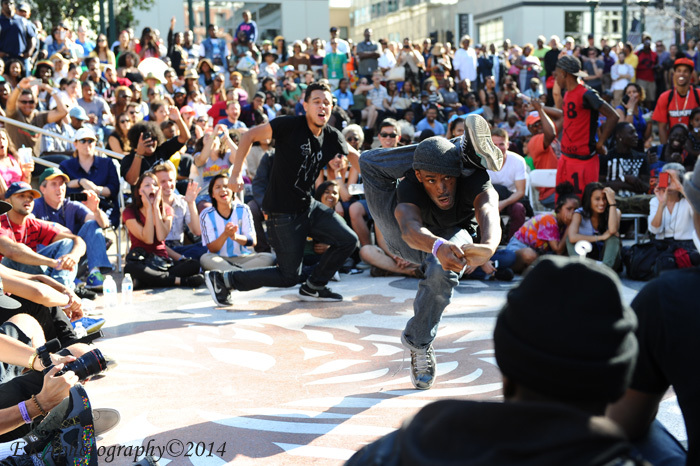 Categories: Dance review | Tags: Art & Soul 2014, Oakland, Turf Dancing, Turf Inc., Yak films | Permalink. Thank you for article. My sons are Dem Bague Boyz. 10 yr old Jaryan aka Poppin Jun and 9 yr old Aiydan aka BBoy A.B. had so much fun that day. Although the finals got alittle intense, they still loved the experience to be able to battle against some of the top Turfers from the Bay. Thanks again to YakFilms, Turf Inc., Turf Feinz, and all the dancers in attendance.